The day before the 200th anniversary of Mississippi statehood, two new interconnected museums will open in Jackson to celebrate 15,000 years of Mississippi history, and Rachel Myers is in the middle of the effort. In February, Myers became director of the Museum of Mississippi History, which will be dedicated on Dec. 9, with an 11 a.m. ceremony, along with the interconnected Mississippi Civil Rights Museum. 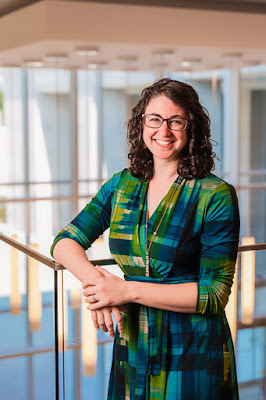 After graduating from Brandeis in 2008, the Connecticut native became an Education Fellow at the Goldring/Woldenberg Institute of Southern Jewish Life in Jackson for two years. In 2010, she became museum and special projects coordinator at the Institute, managing the collection and running outreach and educational programs. Myers is Mississippi State Leader for the American Association of State and Local History and serves on the boards of the Council of American Jewish Museums and Jackson 2000. Before moving to Mississippi, she worked as a program assistant at the New England Aquarium in Boston, and since moving to Mississippi has also completed a master’s in museum studies from Johns Hopkins University. The state’s previous history museum at the Old Capitol closed after Hurricane Katrina tore its roof in 2005. The new museums are a vast expansion, starting with prehistoric times to the current day. The civil rights museum focuses on 1945 to 1975. The Mississippi Civil Rights Museum will be the only state-operated civil rights museum in the nation. Myers said the Mississippi History museum’s theme is “One Mississippi, Many Stories,” and the Jewish story is certainly intertwined. The first three of the museum’s 12 galleries concentrate on Native Americans, then European colonization, enslaved Africans and the wide range of immigrants who came to the state from all over the world. The Jewish story centers on the Alsatian immigrants that arrived from 1840 to 1880, Myers said. Among the profiles of Mississippians is a Jewish merchant in Natchez in the 1880s. Myers is particularly pleased that Macy Hart’s story is included in the museum — and quickly points out that inclusion of the Institute’s founder had taken place long before she joined the museum. Hart will be included in a feature that allows visitors to hear stories from Mississippians, from interviews or, for historical figures, primary sources such as diaries, read by actors. After the initial galleries, the story moves to statehood, how cotton became king, then how the state was remade following the Civil War. The Promise and Peril explores early 20th century changes in technology and a shift from agriculture, and the Mississippi River Flood of 1927. The Great Depression and World War II further changed the state, then came the upheavals of the civil rights era. The Civil Rights Museum takes that time period into greater depth, with eight galleries starting with the history of Africans in Mississippi, slavery, and the origins of the Jim Crow era. The central gallery, “This Little Light of Mine,” honors civil rights activists, including Rabbi Perry Nussbaum, who served Beth Israel in Jackson from 1954 to 1973. With a large proportion of Freedom Summer activists being Jewish, Nussbaum quietly made the 150-mile trek to Parchman State Prison to visit the activists and serve as a link to their families and the outside world. He became more outspoken for civil rights, and in 1967 Beth Israel and Nussbaum’s home were bombed by the Ku Klux Klan. The next four galleries chronicle 1945 to 1975, with a display of mugshots of every Freedom Rider arrested in the state. Of course, the murder of three civil rights workers in Neshoba County in 1964 — Mississippian James Chaney, along with New York Jewish activists Michael Schwerner and Andrew Goodman — is highlighted. The final gallery of the Civil Rights Museum is “Where Do We Go From Here?” challenging visitors to reflect on their experience and consider their own communities. Pamela Junior is director of the Civil Rights Museum. The museum differs from many new museums that concentrate more on graphics and videos, Myers said. There are over 1600 artifacts on display. She particularly enjoys the archaeology collection of items such as spear points from 10,000 years ago, as a way for guests to make a connection to the people who lived in Mississippi back then. There is also a 25-foot dugout canoe, made from a cypress tree, that was made between 1500 and 1600 and was found in the Swan Lake area during a dredging project in 1989. Each of the galleries has something notable, she said, such as women’s clothing that showed how small their waists were back then, an accordion an immigrant brought with him, children’s toys, or blacksmith tools from the Reconstruction period. “All these very personal, intimate objects,” she said. Artists, writers, entrepreneurs, politicians and everyday citizens are highlighted. At the end of the museum, there is a recording booth for visitors to share their Mississippi stories, “something that reminded you of home, or a family story.” Those stories will be played in some of the galleries. There are also Explore Mississippi panels, which suggest that visitors interested in particular exhibits explore those sites around the state. There has been tremendous interest in the museums, with President Donald Trump coming as a last-minute, if controversial, guest. For opening weekend, Meyers said they decided to do tickets with timed admissions for crowd control. The 6,000 tickets were gone the day they were made available. “We’re overwhelmed, but very excited,” she said.